Price can vary greatly dependent on your requirements and the location. Please remember when enquiring to state when, where and the purpose (e.g. wedding, static photoshoot etc). Like The Car? Join the Club, you don’t have to be an owner! UK based DMC builder, renovator and spares supplier. Specialises in performance upgrades for your DeLorean DMC-12. DMCH USA can build you a brand new DeLorean and supply parts. The definitive website for Back To The Future fans. See the U.S. Back To The Future replica. Improved parts over the originals, many look stock. Also supply unique solutions offered by no other vendor. HIRER: A DeLorean from this site is not for self drive. 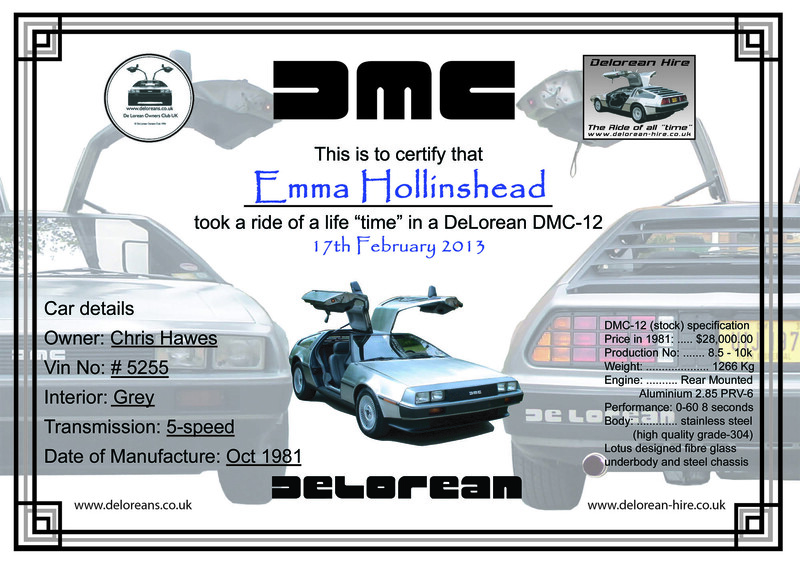 Once you’ve chosen a DeLorean contact the owner with as many details of your event as possible e.g. Location, Duties Required, Dates, Insurance Cover etc. if Public Event or Filming. Upon reaching an agreeable hire price (prices may vary from one car to the next) for your event ask the owner for their methods of payment. Typically a 50% deposit is taken in advance with the balance to be paid on arrival. This deposit is only refundable in the event of major complications on the owners part, e.g. a no-show through ill-health, accident or breakdown. However, the owner will aim to source a back-up vehicle. Please ensure there is adequate, safe and legal parking for the arrival of the vehicle. OWNER: Please endeavor to stick to your booking arrangement. Cashing the 50% deposit is your acceptance of taking the booking from the hirer, so check to ensure that the details are clarified and agreed ahead of the booking. Should you encounter any problems, please inform your hirer as soon as possible. Check with other members as back-up cars may be available in the event of a problem. Please ensure you have adequate insurance cover, it is your responsibility. If you are at a public event or filming, check that you will be covered by the hirers insurance upon arrival. If you fail to appear at the event through your own fault, e.g. ill-health, accident or breakdown, please inform the hirer as soon as possible and return their deposit if you cannot arrange a back-up vehicle. The contract made between the owner and the hirer is strictly between the hirer and owner and not between Delorean-hire.co.uk. Enjoy your DeLorean event!